This is one of the newest condominiums on the pristine 'St Pete Beach'. The building is directly on the beautiful white sandy beach and our unit has an amazing southwest view, Unit 304. It is independently managed to ensure exceptional cleaning, luxury towels and linens,and excellent customer service. We also have many extra amenities specific to our unit which include a 36 inch LCD TV in master bedroom, 50 inch Plasma TV in living room, Tempurpedic-like King Mattress in master bedroom, gel-infused memory foam twin beds in 2nd bedroom, new master bedroom and living room furniture, 2 new patio chairs with ottoman, new dishwasher, and high-end faucet. Fully painted inside and outside in November 2018. Additional information can be emailed to you upon request. The unit is fully furnished, professionally decorated, and maintained to high standards. It has a fully-equipped spacious kitchen and two full baths, all of which have beautiful, 'granite countertops'. The main living area has beautiful, beige tile and the master bedroom has NEW textured designer carpet. The large dining area is situated between the living and kitchen areas and can seat 4-5 people comfortably. The unit is approximately 750 sq ft plus the balcony. A floor plan can be seen as one of the photos in this listing below also. Just a short walk through the pool area and out to the white sandy beach, you can find a nice peaceful spot to sit and relax. 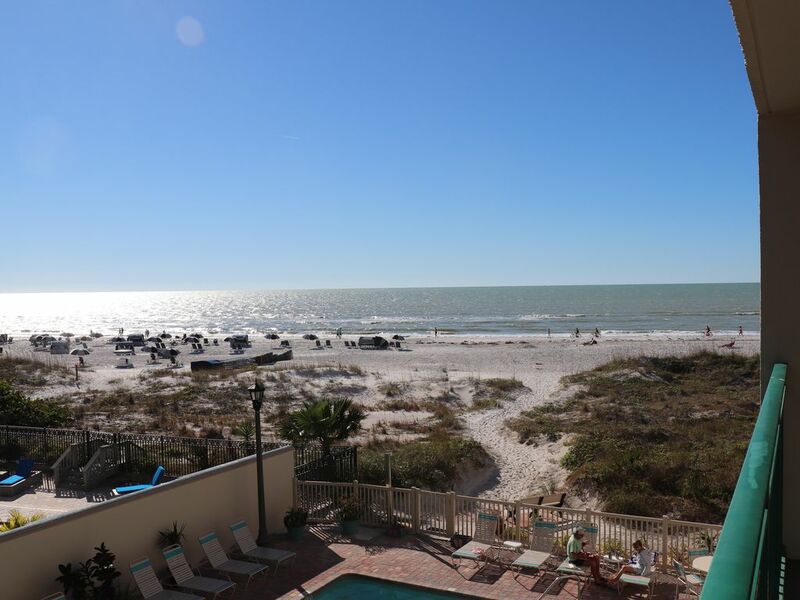 After enjoying the peaceful gulf waters, watching the seaguls, listening to the ocean, and feeling the sunshine, you can easily walk back to the condo, take a dip in the pool, and walk the beach to a nice restaurant or enjoy a meal that you can prepare yourself in our fully equipped kitchen. Walking the beach to the south is the beautiful and historical 'Don Cesar Hotel', where you can enjoy a nice lunch, dinner, or ice cream. On the walk there you will pass an outdoor, beach bar/restaurant with volleyball, live music and great casual food. Just to the north are other fantastic beach-side tiki bars and restaurants which are in walking distance. As for activities, there is a beach rental place for water bikes, kayaks, jet skis, sail boats, etc... about a half mile north of our unit. We recommend the parasailing. It is an unforgettable experience where you will see some exceptional views. There are also fishing, snorkeling, dolpin-watching, sunset sailing boat trips and more at a marina less than a mile away from our unit. (visit the website for 'dolphinlandings' on St. Pete Beach for more details). Additionally, Busch Gardens Amusement Park, great museums, and excellent shopping are all nearby. 'Disney World' is just a 2 hour drive. With our unit, you can enjoy the 'PERSONAL TOUCH' of a privately-managed beach condominium. We may be able to offer early check-in or late check-out depending on our guest schedule. Since we live nearby and visit the unit often, we have added some items which make it a comfortable beach retreat for monthly stays. Please let me know if you have any special requests and I will try to accommodate you. We want you to have a fabulous vacation and return year after year! My husband, David, and I have 2 boys and we live about 45 minutes from our beach condo. David is a sales engineer and I am a computer analyst in addition to handling the rental of our condo. We lead busy lives since we work full time during the week and also are very involved with the boys schooling and activities. I enjoy handling the rental of our one condo since I feel that I have more control over providing the best vacation possible for my guests. I love getting to know all my guests, hearing from them year after year, and sharing my beach retreat with them. It is extremely rewarding work for me, and still is after 14 years. David and I have traveled all around the world and have seen many places. Additionally, we have lived in several Florida towns and have selected the Clearwater/St. Pete area as our home. We love St. Pete Beach for many reasons, and particularily our area of the the beach. Every time we visited the condo, prior to purchasing, we noticed that the beach and water was beautiful and peaceful at all hours of the day. The sand is like white sugar and the water is great for swimming or floating. We love long walks on the beach and stopping for lunch, dinner, or drinks along the way. Our boys enjoy playing paddle ball, building sand castles, and boogie boarding in the water. It is a great place to create family memories that will last forever. I also can't forget the importance of allowing us to rejuvenate and relax (There are no crowds, traffic, or rushing around...only the sounds of the ocean, sitting or walking on the beach, and watching beautiful sunsets.) The condo has been a real blessing. With our unit, you get a spacious living area that accommodates a family of 4 very comfortably. Long stays are easy since it is equipped with a full kitchen, washer/dryer, designer furnishings, luxury linens, and more. You get the peace and serenity of being directly on the beautiful beach. Additionally, we hope you will get some restful nights sleep on an extremely comfortable king temperpedic-like bed with luxury pillows and linens. You can also enjoy our large 50 inch plasma TV in the living room when you want to cool-off in the air conditioning. New, quality master bedroom furniture including a large dresser to store all your clothes was just delivered. Great view of gulf looking southwest. 1 parking space per unit. Guest parking available depending on building occupancy. No stairs to go from parking lot to condo unit to beach. Fantastic gulf view. 50 inch flat screen tv. You can sit in living room and see gulf and beach. new flat screen tv in living room, flat screen tv/dvd in guest room, tv and dvd player in master bedroom. HBO in living room. Beach chairs are normally available for guests to use in hall closet. Beach and Pool toys are in storage box poolside. Large balcony with entrance from master bedroom and living room. Fantastic view of gulf and pool. 4 chairs,2 side tables, and an extra chair to be used inside or outside. Free local phone calls, Radio/CD player, Coffee maker, Cooking Utensils, Cookware, and Dishes provided, Hair dryers, Egyptian Cotton Towels, High Quality Linens and Blankets, Iron and Ironing board, Patio furniture, Heated Pool (shared), free wi-fi. We loved our stay!! The condo was so clean, and perfectly located between so many great walkable restaurants and shops! Awesome hosts that had all the amenities for a great beach vacation! Room was very nice. Pool and beach access was very convenient. Amenities were very nice inside, kitchen had a lot of the things we needed for cooking. Beds were comfy and bathrooms and towels were nice. Beautiful view from balcony and our boys loved the pool and hot tub! We would definitely stay here again. Most people we talked to at the pool said they stay here every year! We had a wonderful time at this beachfront condo. We went for spring break and the weather didnt really cooperate but thankfully the pool was heated and the hot tub was a huge plus. The apartment is very comfortable and we had everything we needed. We had a minor issue with the AC which Donna came over and fixed immediately. The communication with owners since the day i booked was excellent. Location can't be beat. 20 minutes from Downtown St. Pete ( Rainy Day AMC theatre and shopping) and about 15 minutes from John Pass with great shops and restaurants. Publix was less than a mile away and we ate at a wonderful Italian place in that shopping center called Buono Ristorante and our final meal was at Snappers down the street which was great. If you are looking for proximity to beach and pool with a great location, this is it. Feb 2019, the condo was lovely. The furnishings and amenities were just perfect. The view was wonderful as well as the property being located in a prime area. The Peros have done a great job and making sure everything you would possibly need is is the condo already. We were pleasantly surprised to see the kitchen had been updated and the little things we forgot to pick up at the store were already there. We we’re tremely happy with the condo as a whole. Thank you for making our week comfortable!! Very nicely equipped condo. Comfortable with great water view. Cancellation Policy: If you cancel before 30 days to arrival, your money will be refunded except for a $55 cancellation fee. If you cancel within 30 days of your stay, I will refund your deposit of $250 minus the $55 cancellation fee AND try to re-rent your days. If I can re-rent, I will refund the amount I receive which may be less than the amount paid depending on discounts and partial dates re-rented. I will do my best to refund as much as possible, but I cannot guarantee a full refund. Please let me know if you have any questions. Check-in Procedure: Check-in time is anytime after 3:00pm. The keys will be in a lock box outside the onsite office so that upon arrival, you would get the keys and go directly to the unit. Late check-in is not a problem.